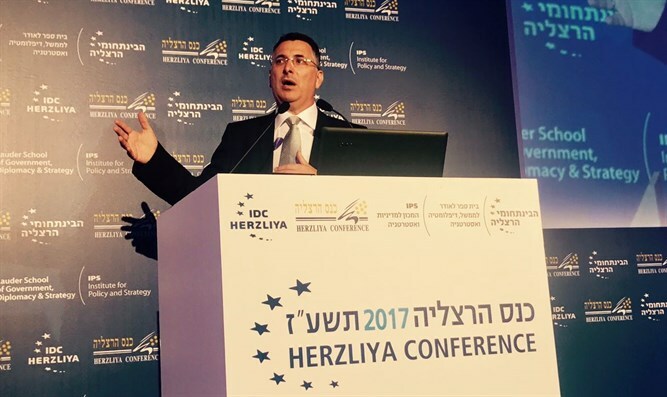 Former Minister and Cabinet Member Gideon Sa'ar spoke Wednesday at the Herzliya Conference and emphasized the litany of challenges facing the State of Israel. He spoke about the issue of construction in all parts of Jerusalem and claimed that "the scope of construction in the Jewish neighborhoods, as opposed to the illegal construction in Arab neighborhoods and the infiltration of Palestinian residents into Jerusalem, changes the demographic ratio [in favor of the Arabs]." "If the current pace of construction in Jerusalem's Jewish neighborhoods is not changed, we will lose the Jewish majority in the city within 15 years," Sa'ar added. "Recent developments have improved Israel's maneuvering space, the disintegration of countries such as Syria and Iraq, the war between Shi'ite Islam and Sunni Islam, and the change of government in the United States ," Sa'ar said . "The more Arab states participate in a political process, the more they will support Palestinian positions and the placement of responsibility on Israel. This is counter to Israel's interests." "A regional political process are not magic words and it is not guaranteed that they will comply with Israeli interests. A Palestinian State cannot relinquish control over security nor [can it stop being a] demographic gateway. A Palestinian State in the territories of Judea and Samaria will not solve a problem - it will create it. He also addressed the social challenges Israel faces. "The Israeli government has succeeded in meeting its economic goals, but has been less [successful] in reaching its social goals, because they have not set measurable social goals, and the government must set measurable goals in the social sphere - reducing gaps, reducing poverty and reducing the cost of housing. Also the developing pension crisis is worthy of being dealt with...National planning is required not only for political issues but also for social issues."